It was a good week for cover versions this week in 1989, with three (well, technically, two and a half) of the new entries on the ARIA top 50 singles chart coming from remakes of previous hits and another song making extensive use of an earlier track. The three covers were of songs that had originated in the 1970s, while the sampled track dated back to the end of the disco era in 1980 - but all three new versions brought the songs right up to date. There was more nostalgia at the summit of the chart as Jive Bunny & The Mastermixers' megamix of rock'n'roll classics, "Swing The Mood", retained the top spot for a third - and thankfully final - week. This wasn't a cover version, but the breakthrough US hit for hair metal band Warrant sounded so much like all those other lighters-in-the-air rock ballads that it may as well have been. A number 2 hit in the States, "Heaven" followed in the steel-tipped boot-steps of Poison's "Every Rose Has Its Thorn" and any number of Bon Jovi power ballads, but Australia didn't bite. It would take a far tastier dish from Warrant to tempt local fans in 1990. They started the year by ascending to the number 1 spot in Australia, and now 11 months later, they finally, er, got around to following up "Kokomo". "Still Cruisin'" was the title track of an odds-and-ends album that featured recently released soundtrack songs, classic hits that'd also featured in films in the previous few years and a couple of other random inclusions (such as an obligatory Brian Wilson track). The song itself was used in the film Lethal Weapon 2 and sounded like the band's vintage material - but while nostalgia was in the air, The Beach Boys revival had clearly run its course and this would be the band's final top 50 chart appearance. Hunters & Collectors are one of those bands whose chart positions don't really give an indication of their true popularity. And, although they've now achieved legendary status in Australia, at the time when their singles and albums were released, they struggled to get recognition. Things did improve for the band slightly in 1989, when they bested their previous singles chart record - by one position. By reaching number 23, "When The River Runs Dry" became the Hunters' highest-charting single up until then, beating 1986's "Say Goodbye", which peaked at number 24. Meanwhile, parent album Ghost Nation returned the band to the albums top 10 - equalling the number 10 peak of Human Frailty (also from 1986). Here's the new entry that took an obscure disco record by Loleatta Holloway and turned it into the year's highest-selling single in the UK and a massive hit in Australia as well. 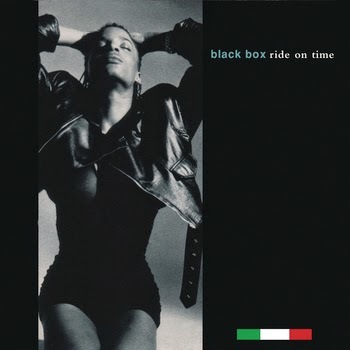 Lifting vocals and musical elements from 1980's "Love Sensation", "Ride On Time" was the debut single released by the Italian production trio of Daniele Davoli, Mirko Limoni and Valerio Semplici as Black Box. While the use of samples on "Ride On Time" had been cleared with Salsoul Records, the label that'd released "Love Sensation", Loleatta was not credited and received no fee for the use of her vocals. While everyone got dragged into court, a remixed version of "Ride On Time" featuring re-recorded vocals by a pre-fame Heather Small was released. That's the one you can hear below, but I prefer the version with Loleatta's original vocal, which I still have on 12" single (but constantly gets removed from YouTube). Further complicating matters was the fact that Black Box was fronted by neither Loleatta nor Heather, but instead a lithe, young French model called Katrin Quinol who mimed in the song's music video and appeared on the single cover. We'd be seeing a lot of Black Box - and Katrin - in the months to come. Wedged in between covers and samples, here's a song that was entirely original - the comeback single by a British female artist known for her quirkiness and left-of-centre releases. Having said that, "The Sensual World" is based on a literary work - Ulysses by James Joyce - but Kate didn't gain the rights to the actual text at the time and came up with her own lyrics rather than just nick what wasn't hers. Despite her rule-following, the chart performance of the title track from her sixth album would have been a bit of a disappointment, especially given her two previous appearances on the ARIA chart had been the top 10 hits "Running Up That Hill" and "Don't Give Up" (with Peter Gabriel). A UK number 1 hit in 1975 for Steve Harley & Cockney Rebel, "Make Me Smile (Come Up And See Me)" has actually been covered by two of my all-time favourite British synth/New Wave bands - Duran Duran and Erasure - but this 1989 remake is the epitome of '80s Aussie rock and quite close to the drunken pub sing-along feel of the original. For Melbourne-based Nick Barker & The Reptiles, the cover was a good idea - giving the band its first hit following two singles, "Another Me" and "(Sure Beats) Going To Pieces", that'd missed the top 50 earlier in 1989. For her third single from Brave, Kate Ceberano hedged her bets by teaming the album's ballad title track with the much funkier ode to toy boys - a song originally performed under the title "Young Girls Are My Weakness" by Commodores on their debut album, Machine Gun. The double A-side duly became her third top 15 hit since launching her solo pop career at the start of the year. Of the two, I much preferred "Brave" and, as I mentioned when we saw "Love Dimension" chart a few months ago, thought it would have been a more commercially successful follow-up to "Bedroom Eyes". As for "Young Boys...", it was an obvious single thanks to its racy icky song title (Kate was 22 going on 23, which meant she was probably singing about 18- and 19-year-olds), but was actually my least favourite track on the album. Speaking of double A-side releases - the original version of this song was released by Carole King in 1971 alongside "It's Too Late" (another frequently covered song). In both Australia and the UK, Martika's version of "I Feel The Earth Move" became her second top 10 hit in a row but it was a different story in the States, where it only reached number 25 and was struck from radio playlists after a San Francisco earthquake in mid-October killed 63 people and injured thousands more. In a tragic coincidence, there was a similar situation during the song's release in Australia - the Newcastle earthquake struck in late December while the single was in the ARIA top 5. Bizarrely, though, "I Feel The Earth Move" went on to achieve its highest chart position here in the wake of the earthquake. Next week: the second sign of the Stock Aitken Waterman apocalypse thanks to a totally unnecessary cover version of a late '70s classic. Plus, everyone's favourite Go-Go was back with a new smash hit. I thought the ballad from Warrant's second album, 'I Saw Red', was much better than this sappy effort. I don't know why, but I really liked the Beach Boys' single at the time, and was nearly going to buy it on cassingle. I didn't notice that rage aired it a few years ago (going by the video posted) - but it was during the years when they had the awful ABC1 watermark in the 4:3 area, which explains why I overlooked it. But the watermark isn't on this video, so maybe they switched if off that night. Radio played the Hunters' single a lot. The crash test dummies scenes spooked me a little at the time. I never saw the Katrin Quinol lip-synced video for 'Ride On Time' until the mid 00's. I don't think it ever aired on TV here - instead we got a probably cheaply thrown together by the local record company video, which I uploaded here - http://www.youtube.com/watch?v=NZBUobBeu1k , perhaps due to the scandal of Katrin miming (and being caught out). Though I remember another video that was shown for it early on, on Countdown Revolution, featuring space footage. In case you or anyone reading hasn't seen it, there's a video of Katrin's real live vocals (until they switch her mic off) doing 'I Don't Know Anybody Else' here - https://www.youtube.com/watch?v=Zc67EL6hUxc - though it's blocked in Australia (and Australia only, oddly)... maybe you can view it with a proxy. Although I knew 'Wuthering Heights', 'Babooshka', 'Running Up That Hill' and 'Don't Give Up', I didn't know Kate Bush sang them (though I'd heard of her) when 'The Sensual World' was released. When I first saw it on Countdown Revolution, I thought 'oh no, some boring artist from years and years ago', but it quickly grew on me, and I grew to like her music a lot. This song was so different to anything else at the time. It was another track where I was nearly going to buy the single (and the follow-up, which I'd never heard at the time, but wanted to hear), but didn't. My pocket money obviously didn't extend far enough. I haven't heard the Nick Barker single in a long time. The backing vocal on the chorus sounds rather like Jon Stevens from Noiseworks. I hadn't warmed to Kate Ceberano yet when the double A-side hit the chart, but 'Brave' grew on me. It wasn't until probably a month into its chart run though that rage also played 'Young Boys...', where I heard it for the first time and also liked it. I loved the Martika track, and thought from when I first heard it that it sounds quite like a S/A/W production. I first heard it on Triple M's Top 8 at 8, and remember taking the tape I recorded it on, with my walkman, to school one day. I've read that one reason Big Fun's cover of 'I Feel the Earth Move' was scrapped as a single was because they didn't want to clash with Martika's version... even though theirs was ready to release a few months prior. I found my copy of this week's chart from 1989 earlier, and it also has the thin white line through the 5 in the date, so that wasn't just a momentary printing glitch. Gavin, thanks for the heads up on the saga around 'Ride On Time'. The only video version I have seen (until now) is the one that Nathan mentions, as the cheaply put together one. So the Katrin miming was the first video? When was that pulled? So the single 'Ride On Time' as we know it, is that the Heather Small version? When did they pull the Loleatta's version? I remember people always saying that Katrin was a transexual. Was she? (sorry, maybe I should be getting onto Wikipedia to find all this out. LoL.) Also, is that her in the US remix video of 'Everybody Everybody'? I must admit, this is where I question it also. 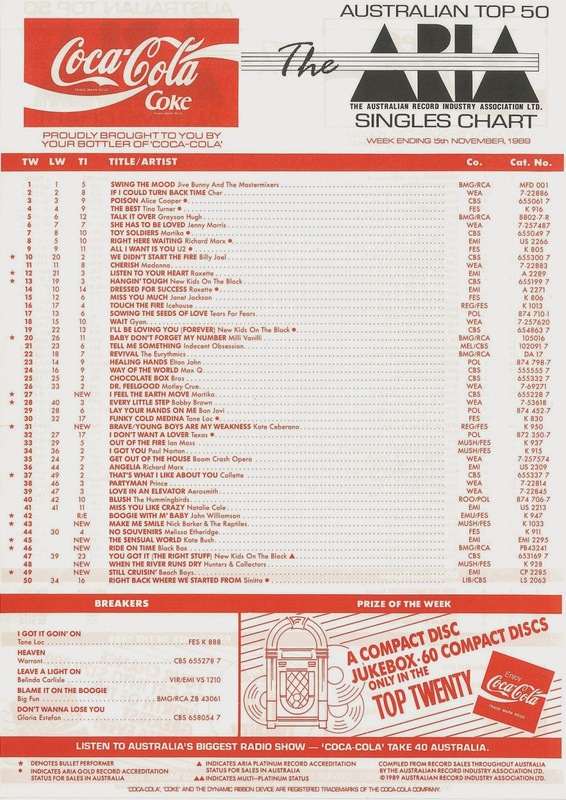 I also had no idea about the US chart performance of Martika's 'I Feel The Earth Move'. I only noticed a few months ago that it only got to No.25 there. I did Q why, so thanks for answering it for me. I actually bought Martika's self titled album about 6 months ago and love it. One of those albums that you think about buying over the years and don't until you finally bite the bullet. Remember when Kylie suffered something similar when she released 'Impossible Princess' the same time Princess Diana died. The title of the album killed the record and almost her career, well in the UK, but funnily enough it was quite the opposite here. I really don't like 'Young Boys Are My Weakness'. 'Brave' was such a better single, a lot more mature sounding and just has that magic to it. Also like that its longer than your typical 3-4 minute pop song. I like Warrants 'Heaven' and yes, 'I Saw Red' is their best single. 'Cherrie Pie' was a fun novelty hit back then, but I cannot stand it these days. Just sounds really bad. I was surprised that Kate's 'The Sensual World' did so poorly here. I thought all her fans would have marched out and bought it to at least make it Top 20 in its first week. Katrin was the face of the band but after Ride On Time, Martha Wash provided vocals - but I'll go into that more when I Don't Know Anybody Else debuts. Plus, the questions surrounding Katrin's gender. I couldn't see the dodgy Ride On Time video on YouTube, but I must say I didn't look too hard for it, so I'm glad Nathan has posted a link to it. I'm pretty sure Australia never got the Loleatta version of the song and that we always had the remix because by the time it came out here, the legal action had begun in Europe. I don't want to spoil Gavin's future discussions on Katrin's gender, but I think she looks her most gender ambiguous in the 'Strike It Up' video. I don't know whether she is or isn't, but I remember her being questioned about it in a Smash Hits interview published in the local edition around July 1990. I also remember an article in Number One, interviewing Loleatta Holloway on the scandal, and showing a picture of her crushing a 'Ride On Time' 7" single in her hands, ha ha. Interestingly, Number One published a letter from a reader, a Weather Girls fan, who spotted Martha's voice on 'I Don't Know...' straight after it was released.